It’s become a popular notion that anchor tattoos were only for seafarers. This is because the anchors are pertained to work on the sea, like the navy, sailors and so on. However in the recent times, this thinking has changed. You can see more and more people getting anchor tattoos for themselves not because they are working at sea but because of the deeper meaning the tattoo has. 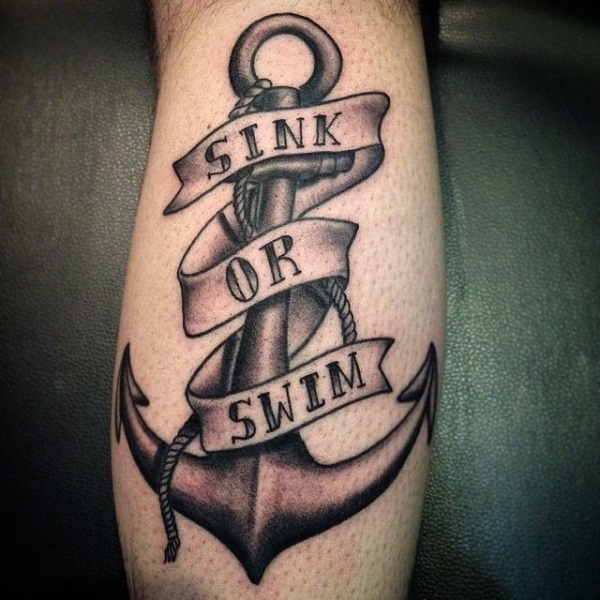 Owing to the growing popularity of the anchor tattoos a lot more people have become interested in them and are also looking into getting one for themselves. Among one of the places that the anchor tattoos have become popular is within the rock scene. Many rockers have the liking to adding their own twist into the anchor tattoo. Nowadays it’s not only men who don this tattoo but more women as well partake into getting anchor tattoos and it actually looks very good on them. Not only that but Christian circles are also using it as a symbol of stability and strength. When you look at missionaries they also love donning these tattoos that can express their individuality. You usually find them on the ankles and behind the ear. There is more to it when you talk about the anchor tattoo. When you look at it, all you see are ships, the sea and something that holds the ship when it docks. However, before, the anchor tattoo was known to be used as a symbol for the Holy Cross. Yes, it is far from being a perfect cross but it does its job well in camouflaging. Religion was a very touchy subject and for people who did not want to be judged they would hide their beliefs with the help of the anchor design. Of course, the people who had this tattoo also need to keep it well hidden from prying eyes. It’s both smart and risky for people of faith to take this step. Why is the anchor tattoo a symbol for stability and strength? An anchor is used by ships when docking or when they need to get steady at sea. This goes the same way as life. An anchor keeps you grounded and stable. The heavy weight of the anchor also represents the strength of that person’s belief. An anchor is an anchor either technically or figuratively. It’s something to keep you rooted in what you believe in and not sway into other temptation. Tattoos like these are great for reminding or keeping the faith alive for one person. Tattoos can’t only be used to describe one’s self. They can also be used to describe somebody who has influenced a person deeply. Anchor tattoos can also have this function. You can customize a person’s name or face with the anchor to remind you that he or she is the one who keeps you afloat and gives you the strength to move on. You can also do with icons that you look up in your life. It can also be incorporated through objects or memorabilia or even places that you hold dear to you. 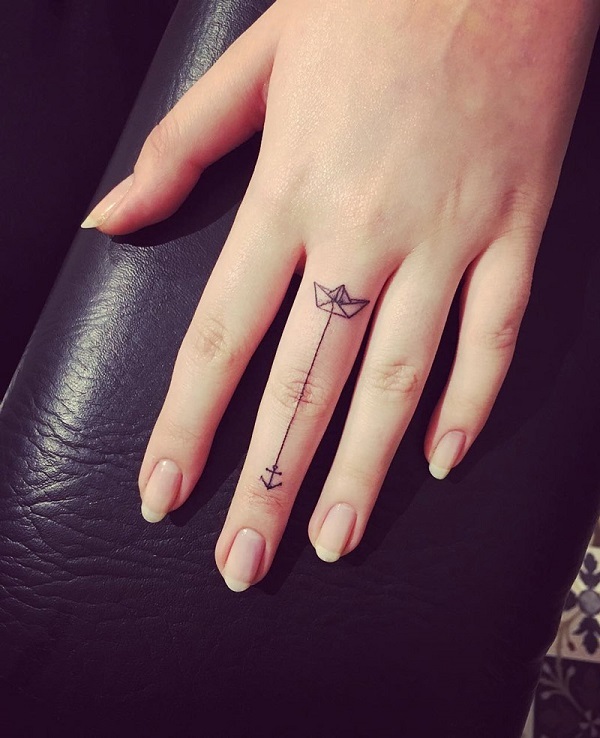 The beauty of anchor tattoos is that they are not only a great symbolism but they can come out as unique with whatever you decide to pair them up with. 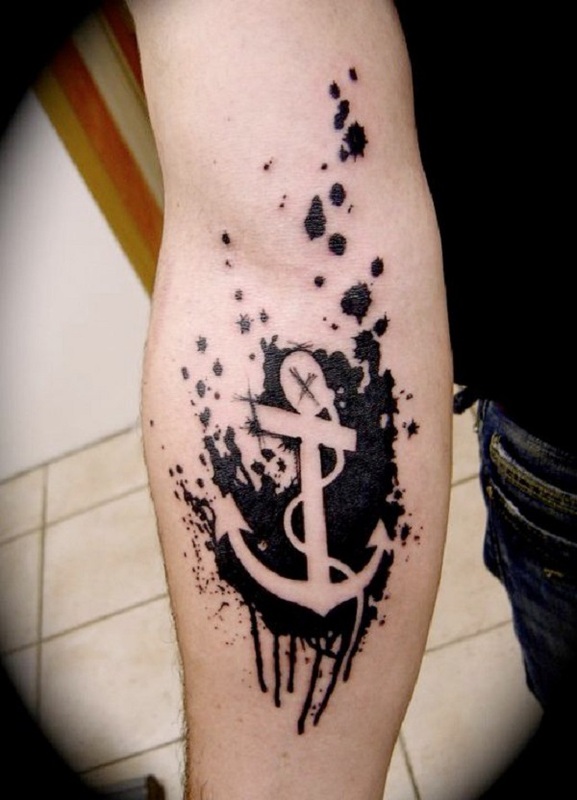 There is no limit as to who or what you want your anchor tattoo to be designed with. What’s important is that these people or objects are those who have impact in your life and serve as anchor when the storm comes. Anchors can represent people who have given you strength and hope in your life. You can use anchor tattoos to represent as the people who helped you out before or those who continue to inspire you to keep on living life. You can also get inspiration from physical things and nature that mean something deep for you. You can easily incorporate the elements of nature into the anchor design. One of the most prominent elemental factors that are associated with the anchor is the sea. The sea is deep and mysterious which is why the anchor serves as the faith and the resolve of a person who plunges into the depths of life and hanging on to what they believe in. the anchor keeps the ship intact and well grounded despite the turbulence of life. What if you want to have your very own anchor tattoo however you don’t know which one you should pick? There are plenty of wonderful designs out there and you will really get confused for the first time if you don’t have anything specific in mind. First off you need to think about the meaning that you want your tattoo to have. 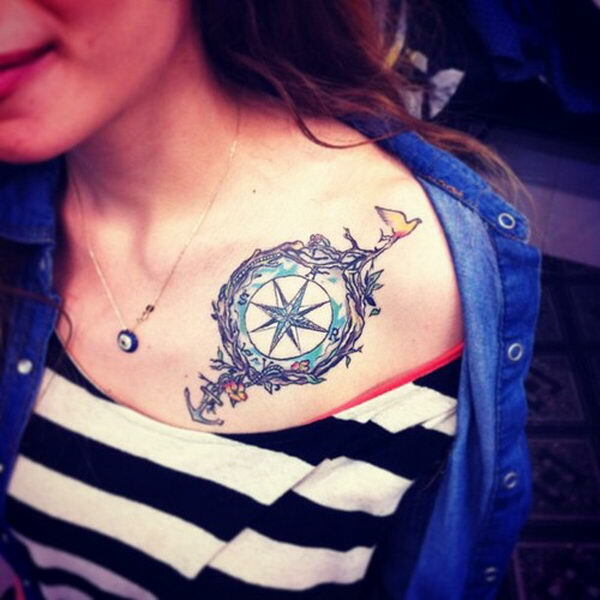 From the meaning which you want to convey you can carefully plan out what elements you wish your tattoo will have. This will make the choosing much easier and less complicated than endlessly flipping through the tattoo design pages. You can also try and get references online to bring to your tattoo artist. This also helps in making clear what you want and which element should go into which place. Always plan ahead and make sure that you think about getting the tattoo. It may take weeks or months but always come with an open mind and a prepared heart. You know you want this and you have decided to get it to show what your true beliefs are. 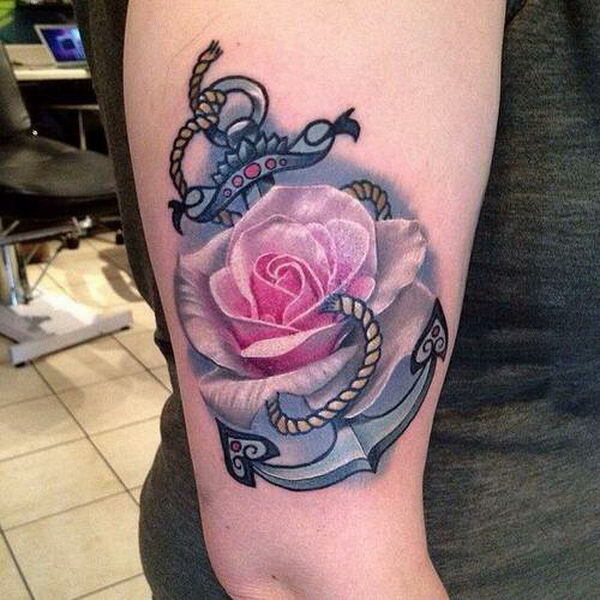 Beautiful anchor tattoo with a rose embedded into it. The anchor is seen to be enveloping the rose with a striking contrast of the bold and strong anchor with the soft colors of the rose. 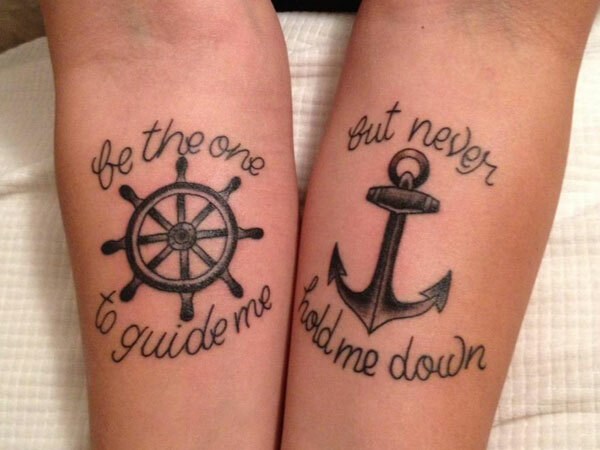 A combination of the anchor and ship wheel tattoos. These two are great combinations especially with meaningful quotes paired up with them. Black inked blood drenched anchor tattoo. The tattoo shows an anchor being dropped off and leaving trails of blood as it continues sliding down. 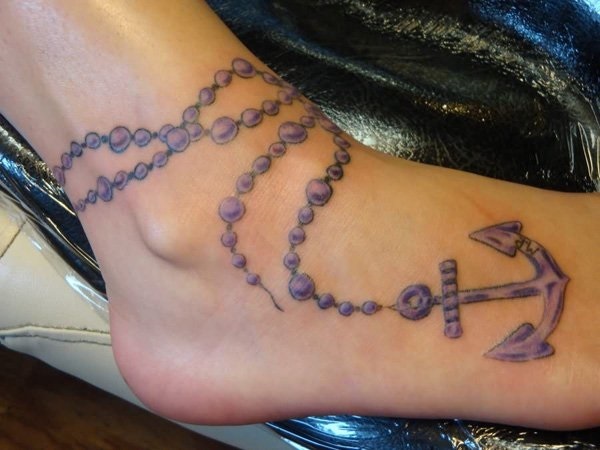 An anchor tattoo creatively embedded into a rosary. There are plenty of ways to show anchors with your faith and this is possibly one of the most meaningful and creative ways to do that. 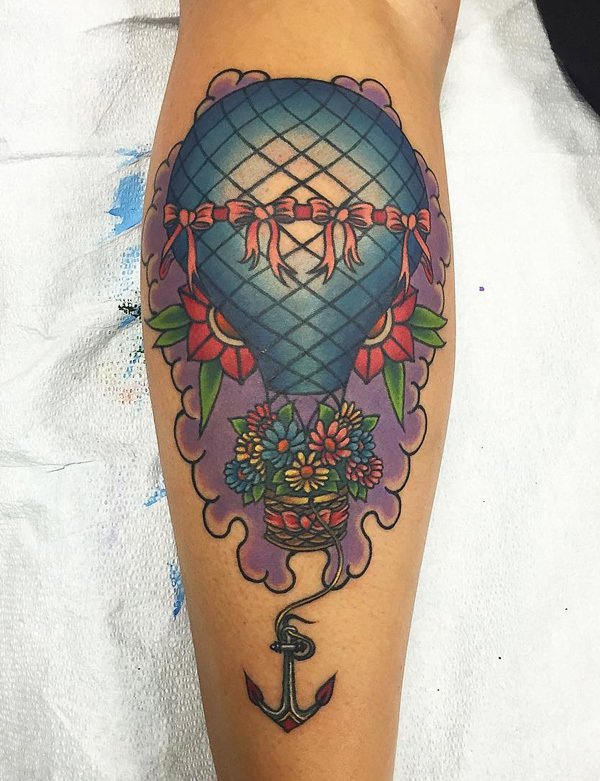 Beautiful anchor tattoo attached to a hot air balloon filled with flowers. The bold and bright colors simply bring out the positivity and the joy that the tattoo exudes. 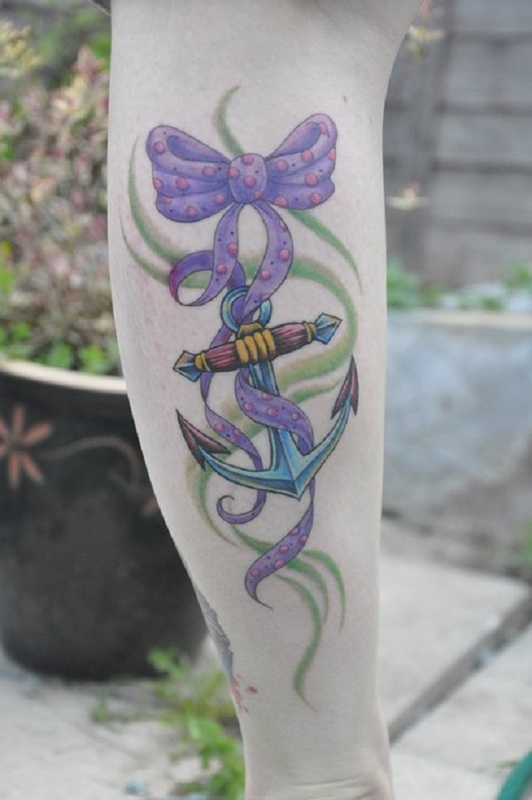 Pretty anchor tattoo combined with a ribbon in polka dots. The ribbon hives the anchor tattoo a softer impact and despite the different auras the two objects have, the blend well together. Abstract anchor tattoo on the hand. The striking black, gray and white ink for this tattoo does well to give out the strong look of the tattoo as well as to bring out the strength of the tattoo. Simply yet meaningful anchor hand tattoo. 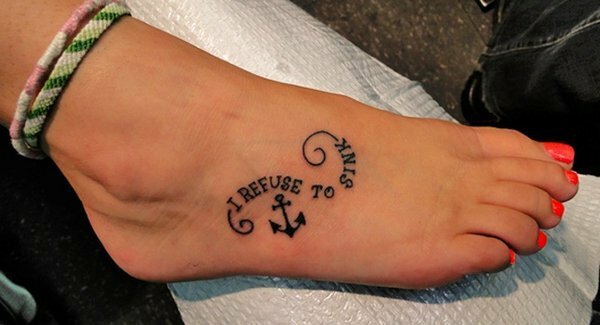 If you want a small and beautiful anchor tattoo combined with your favorite phrase then this style is a great choice. Elegant anchor tattoo drawn with a chain. A very neat looking anchor tattoo with a simple chain dangling over it with a fan like structure at the end. 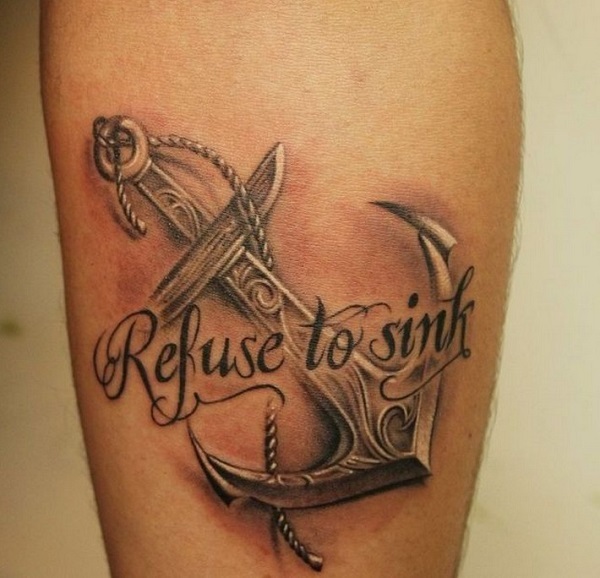 A very detailed anchor tattoo that chooses to convey a strong message. The anchor is decorated with huge eagle wings and a skull right in the middle of the anchor. Beautifully inked and well represented. Another abstract inspired anchor tattoo. In black and red ink the anchor seems to be passing several triangle objects that look to be dancing around. Beautiful dated anchor tattoo. The tattoo is designed to look like one of those old maps with the help of the light ink and cursive writing. Small and cute anchor tattoo. 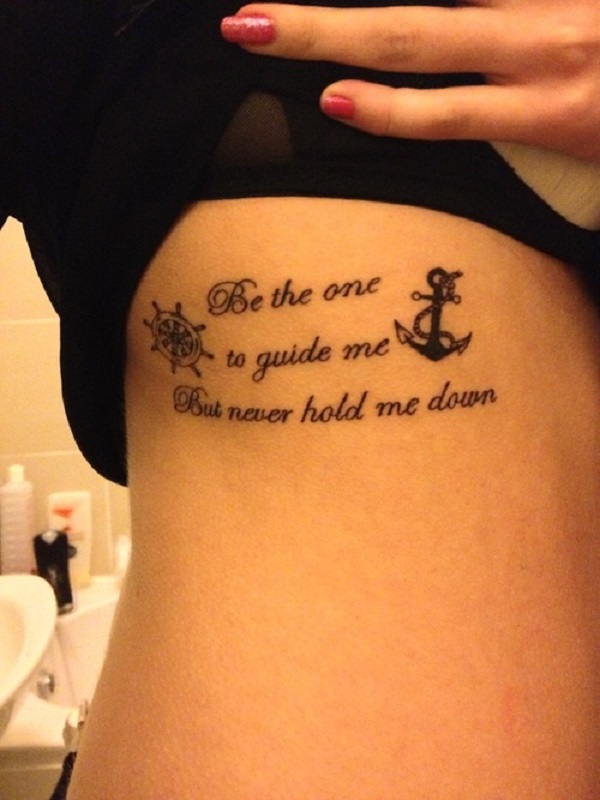 The best way to keep yourself up with an anchor tattoo is designing them in petite designs that have weighted meaning. 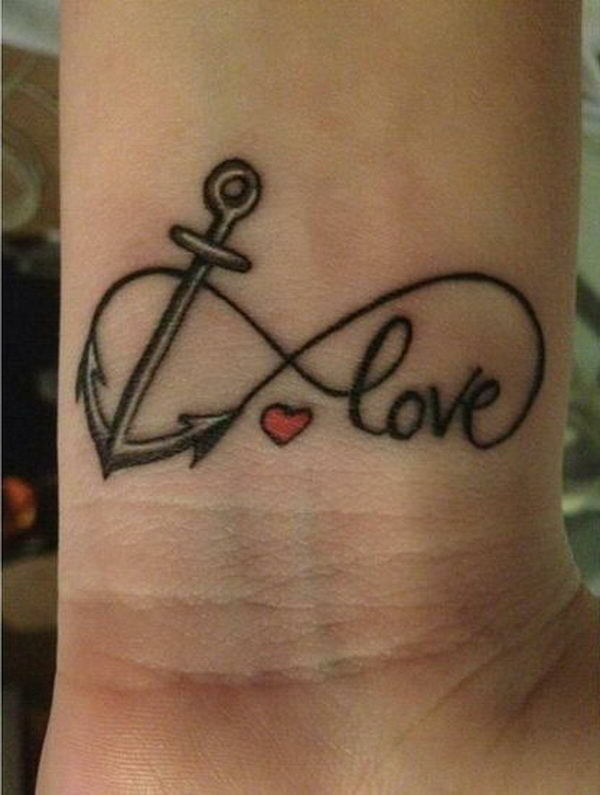 Wonderful looking anchor tattoo with a heart symbol. The ropes around the anchor tattoo are arranged in a beautiful heart shape. Anchor and flowers tattoo. Beautifully inked and well drawn. The combination of the soft colors and design makes the tattoo look endearing and meaningful. Twin anchor tattoos. Very detailed with tribal symbols, the twin anchor tattoos are drawn bold and black ink signifying the strength and resolve that it denotes. 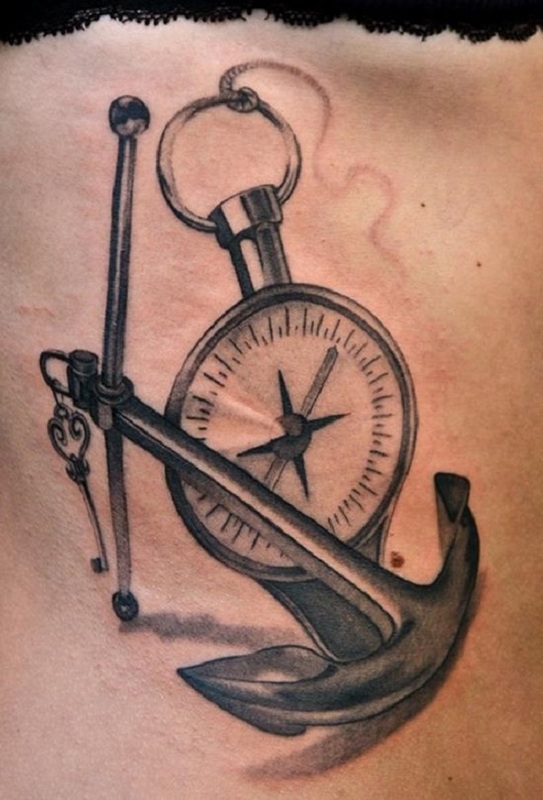 Anchor tattoo with a compass. The perfect combination when navigating the sea. This can also be used t to convey a person navigating his direction in the sea of life. 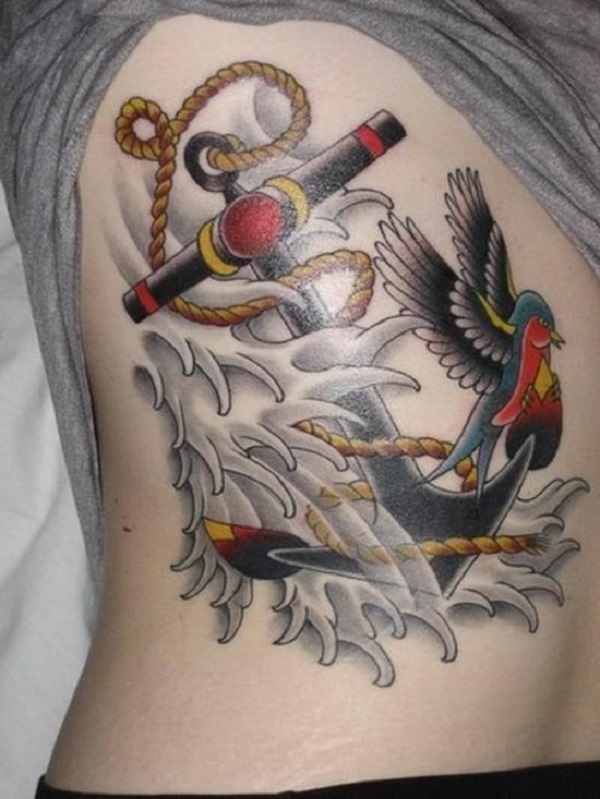 Beautiful anchor tattoo with a flight of birds. Artistically designed and positioned as if to create the illusion of waves from the sea and the birds flying upwards to the sky. A simple and small anchor and ship wheel tattoo. Perfect pair of tattoos when you want to add your very own special quote with it. A falling anchor tattoo with a rose attached n it and hanging by a safety pin. A truly eye catching design with deep meaning, perfect if you’re not afraid of a few pricks here and there and want to take a stand. 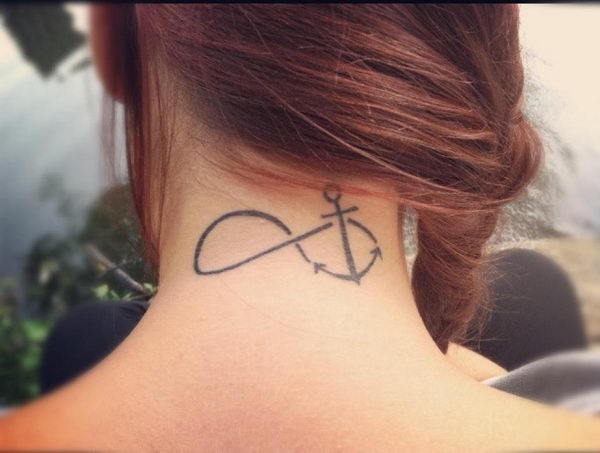 Very simple and cute anchor tattoo. If you want something simple and neat, this tattoo is perfect. It may look not much but the definition it wants to give is crystal clear. Well detailed anchor tattoo. Instead of the regular rope that hangs around the anchor, it shows a ribbon with a quote on top of it. Artistic and straight to the point. Wonderfully colored anchor tattoo. Deviant from the regular black inked anchor tattoos, this one is designed to look pleasant and beautiful with all the flowers and water droplets in the detail. 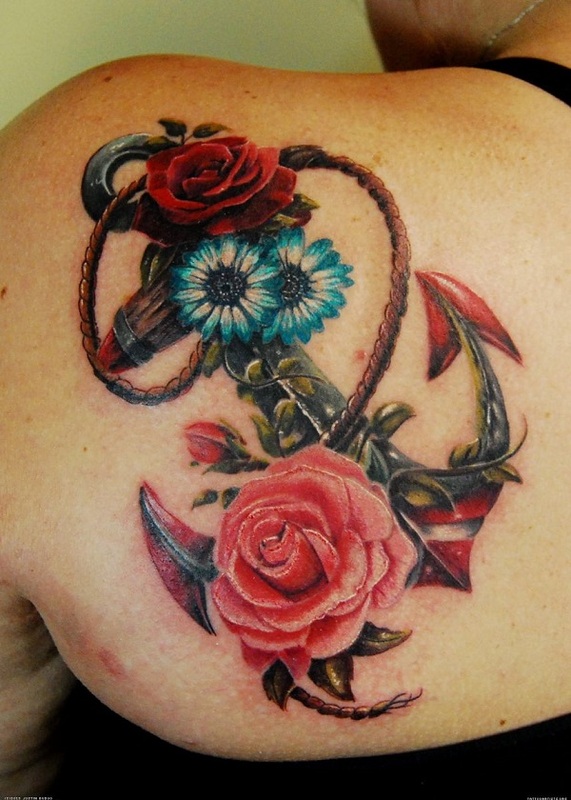 Anchor tattoo adorned with flowers. The anchor is shown to be made up of blue flowers which are both adorable and feminine. This is a great design to show the mellow side of a person. A crossover of the anchor and infinity design. Simple and straight to the point. This is a great tattoo that you can have well hidden and shown when you want to. It also conveys a powerful message within. 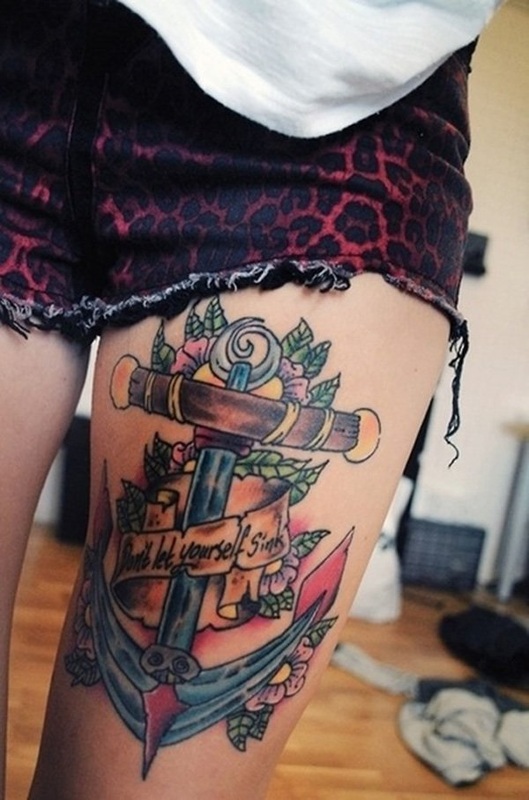 A strong and bold anchor tattoo filled with color. 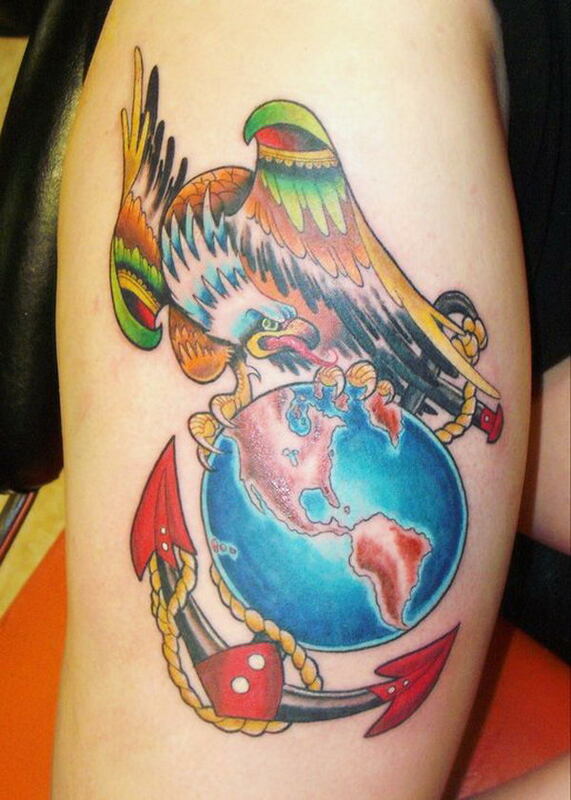 A really strong looking tattoo with the world shown to be at the center of the anchor with a mighty eagle on top of it. Very pretty and well detailed anchor tattoo. The details inked on the anchor itself are truly mesmerizing and the cursive writing of the quote gives a wonderful accent to the overall message of the tattoo. 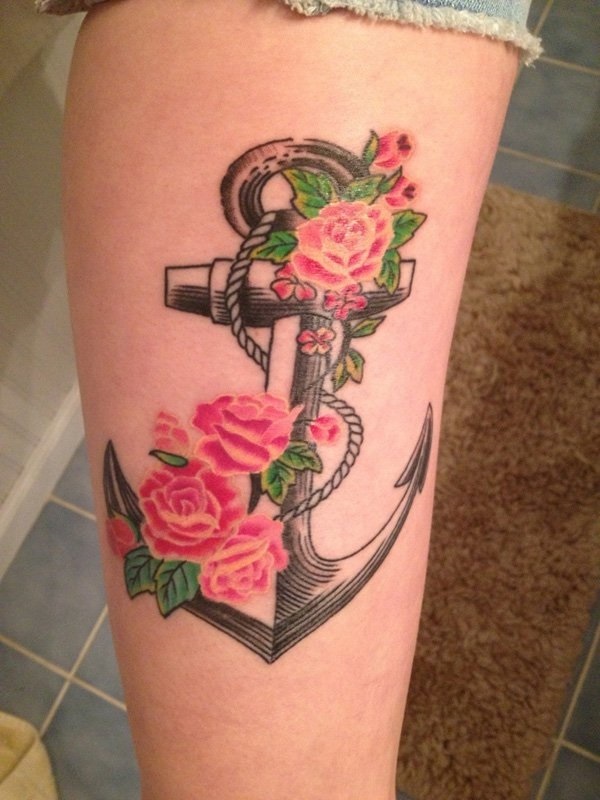 Beautiful anchor tattoo with roses. The anchor is shown to be hung at the side of the ship with red roses sprouting from all over the anchor. 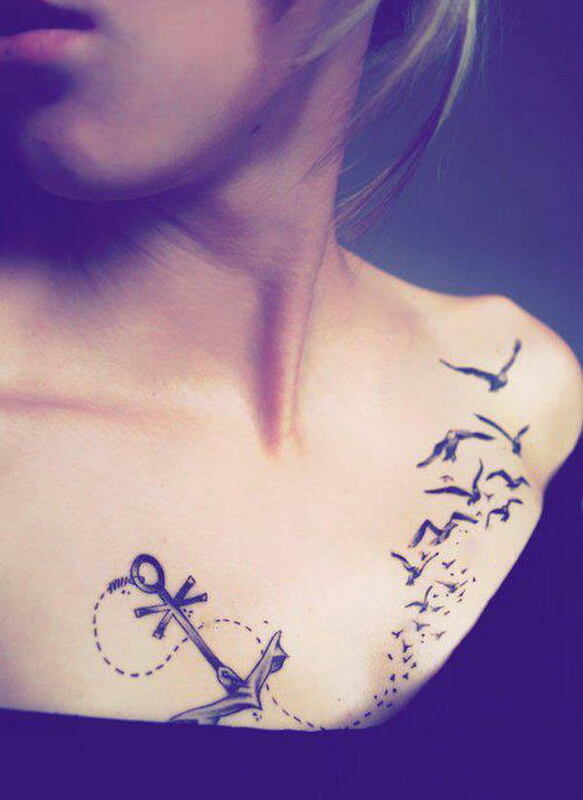 A serene anchor tattoo with birds flying from it. Very neat and simple looking tattoo that shows strength and at the same time freedom. Anchor tattoo wrapped up in a flower. The anchor is shown to be engulfed by a large flower with falling petals. It’s a combination of two unlikely objects that simply look amazing together. 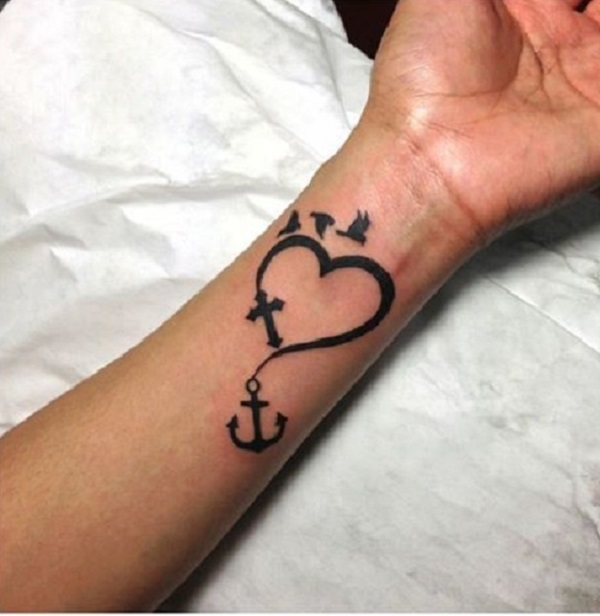 Anchor tattoo arranged in a heart shape. The cute details in this tattoo are simply adorable. There is the heart shape tail of the anchor along with birds flying peacefully overhead. Colorful anchor tattoo. The anchor is shown to be hitting the sea waves with a bird as its guide. There is definite symbolism with the objects and elements around the anchor which help strengthen its meaning. 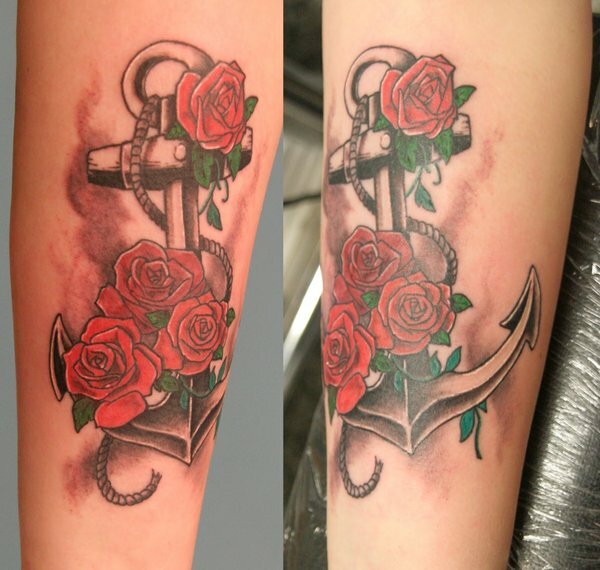 Another beautiful anchor tattoo adorned with roses. The pretty pink roses are shown to be clinging on to the anchor which definitely shows a softer and more feminine side to the definition of the tattoo. A mermaid and anchor tattoo. This is a fairly unique design as mermaids were believed to lure sailors into oblivion; however this tattoo tries to depict it differently and tries to show the mermaid as the muse of the anchor. 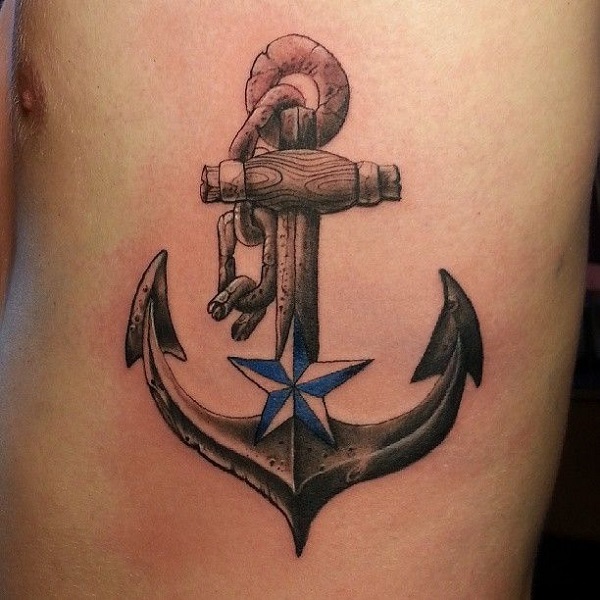 Well detailed anchor tattoo with a star in the middle. Simple, yet direct to the point. 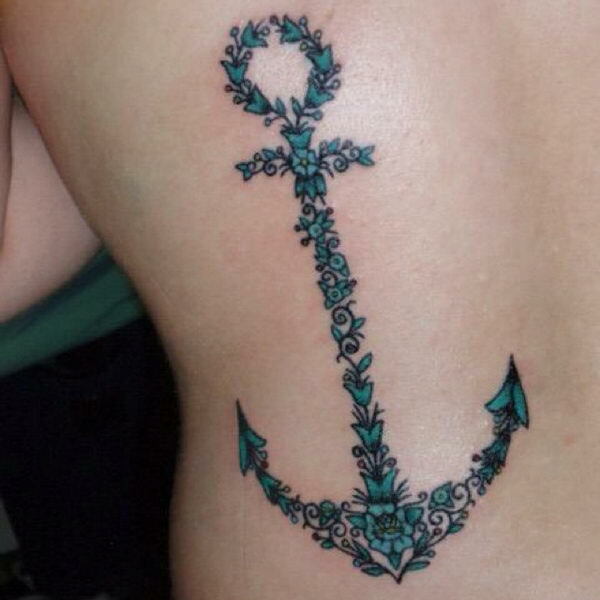 A neat and wonderful looking anchor tattoo. 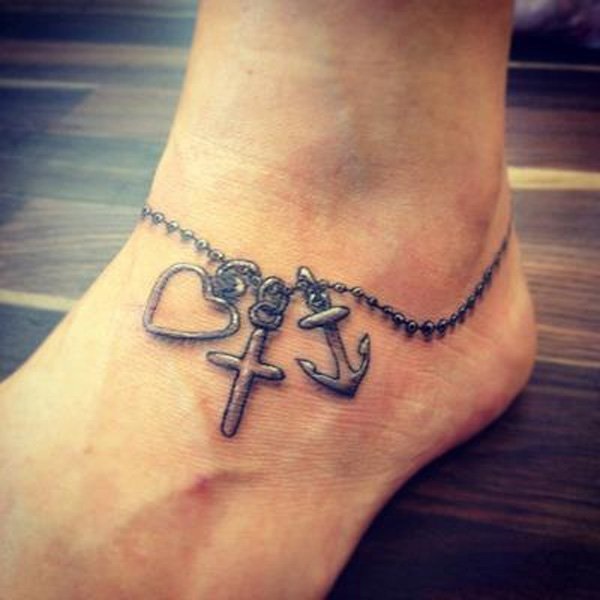 An anklet anchor tattoo. The anklet tattoo shows two other objects other than the anchor which is the heart shape and a cross which means that these three symbols have an impact in the person’s life collectively. An eye catching anchor tattoo in full color. 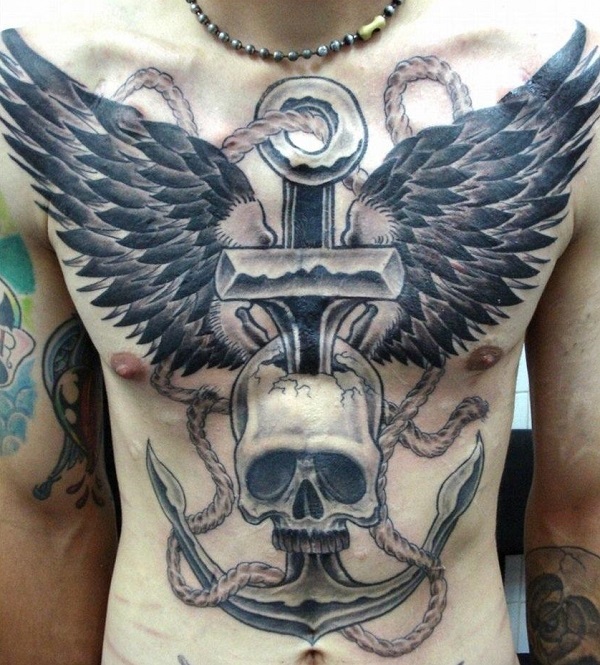 The tattoo showcases an anchor which has wings spread out and a skull detail seemingly biting the handle. There is also a collection of stars that envelope the red circle behind the anchor. 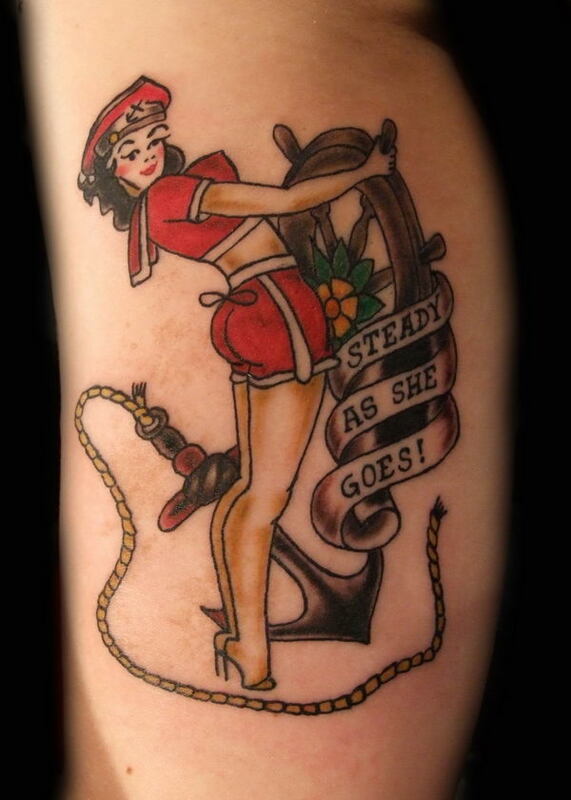 And anchor tattoo with a sailor woman. A pretty sailor woman in red is shown to be holding the ship wheel with the anchor beneath her. 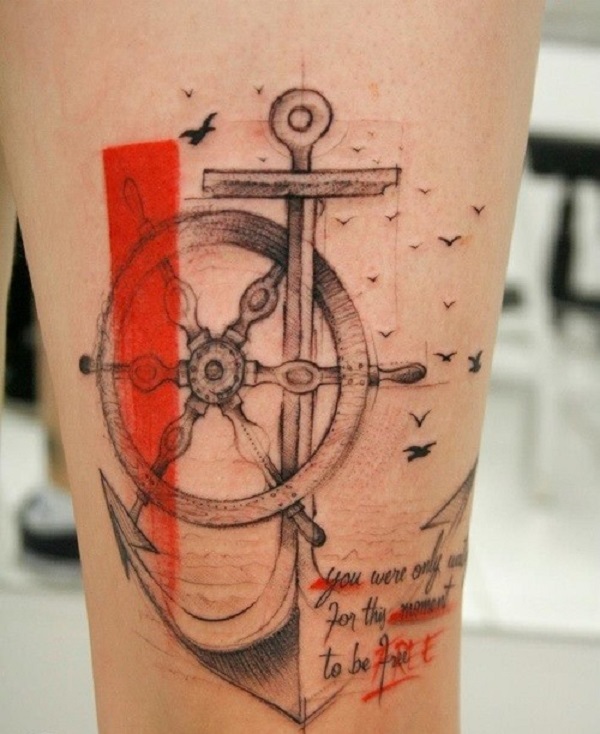 A paired tattoo of an anchor and ship wheel. These two are the best combinations when it comes to the anchor tattoo because of how they perfectly balance each other especially when placed on different parts of the body. A very beautiful looking anchor tattoo n the shoulder. Drawn in detail and with a blue star in the middle, the tattoo looks mystifying and elegant. Anchor tattoo with an explosion of colors. The tattoo is adorned with colorful flowers and leaves from behind and displays a quote written on a parchment in front of it. White anchor tattoo. 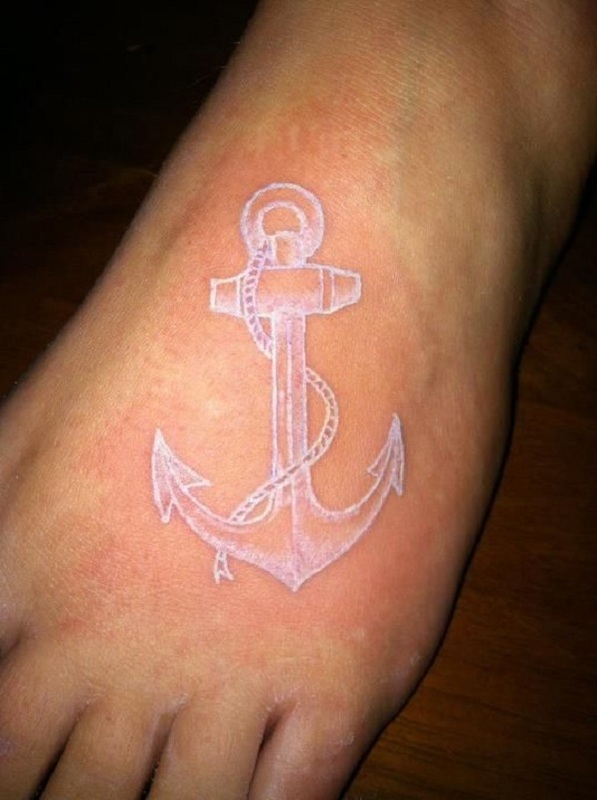 A very unique looking anchor tattoo that is inked in white and looks very simply yet beautiful the longer you look at it. 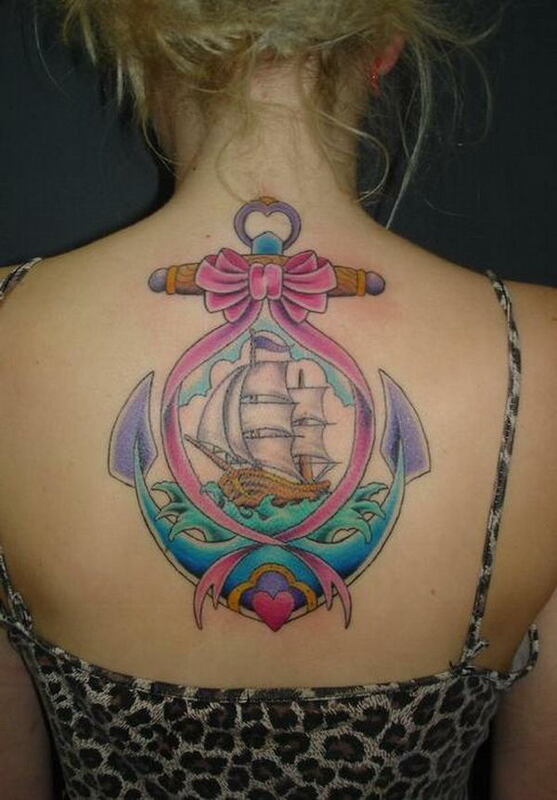 Very pretty and colorful anchor tattoo. The tattoo is tied with a pink ribbon and shows a ship in the middle of the sea in it. The heart symbol adds to the femininity that the tattoo conveys. Well detailed and beautiful anchor tattoo. The tattoo carries a strong quote paced on top of the anchor which shows the strength that the anchor symbol serves for the person. 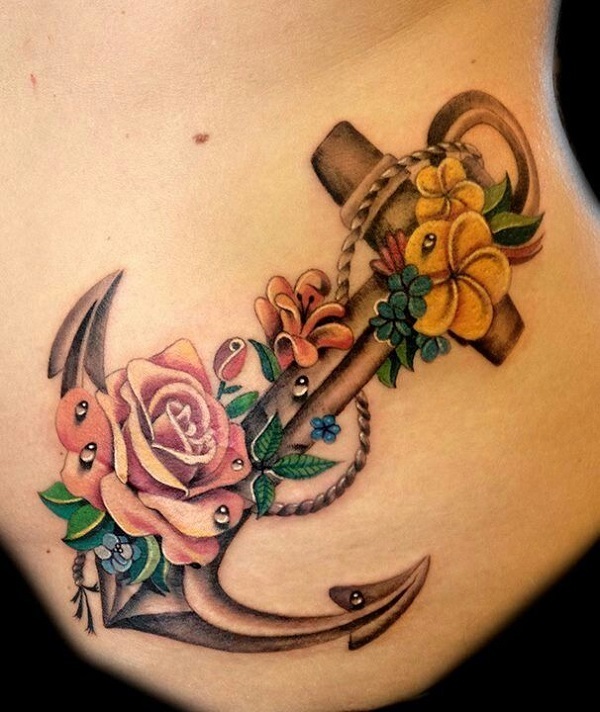 Beautiful anchor tattoo with flowers. Flowers and anchors have been the most popular tattoo combinations because they are the opposite elements that show how a person truly feels and are perfect together.